I saw Dante in Florence just before the Ponte Vecchio bridge crossing the Arno river. He has a rather small stature, with big eyes and a prominently hooked nose. He looks more like a common man, a man on the street. I hesitated for a moment whether I could greet him as he looked deeply in thought looking across the river. Surprisingly he is quite friendly person and didn’t mind to talk to a stranger. And throughout Hell thy name is spread abroad! And thou thereby to no great honour risest." “There are many prominent people of Florence living in Hell because of their sins. Filippo Argenteni has hid horse shod with silver and has iron fists. He has a violent temper, one time he slapped me, and his brother took possesion of of my conviscated property. Farinata degli Uberti is a heretic, he believes that there is no soul and that everything dies with the body. He regarded the pleasures of life on earth as the highest goal for man. 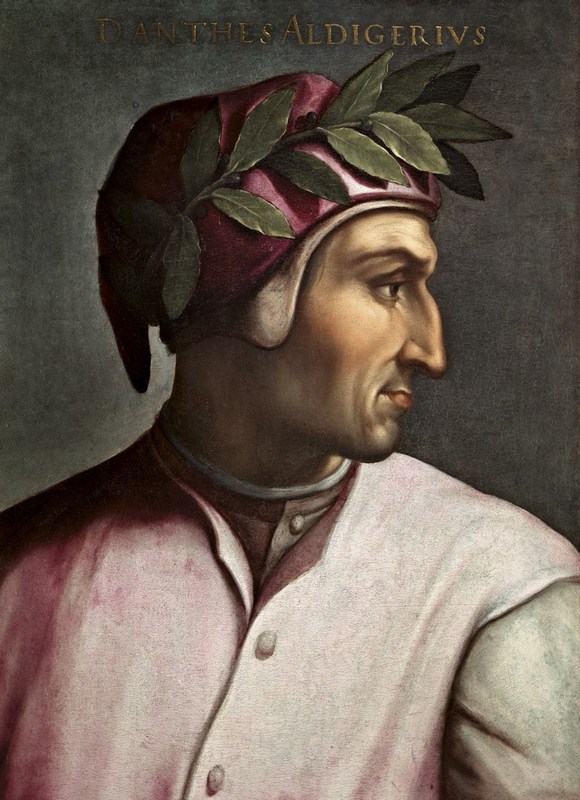 Bocca degli Abati betrayed his guelph countrymen at a decisive moment in the battle -as German mercenary troops attacked in support of the Tuscan ghibellines- by cutting off the hand of the guelph standard-bearer. Demoralized by Bocca's treachery and the loss of their flag, the guelphs panicked and were roundly defeated. Then there is my gluttonous friend Ciacco, the hog, spend his life gorging his appetites and living in excess. “Following your path in Purgatory Canto 30 you kind of confessed that you were unfaithful to Beatrice, the one you adore and love so much. You said you fell in love with her the first time you met her, and in Vita Nuova you wrote about her and declared “Behold, a deity stronger than I; who coming, shall rule over me”. It seems you are completely captivated by her after the first meeting, however at that time you were just nine and she was eight“. “Himself from me he took and gave to others. “Back to Inferno Canto 26, you found Ulysses, the legendary Greek king of Ithaca and the hero of Homer's epic poem, you found him in Hell. Yet during his lifetime this man had the approval of heaven. The goddess Athena, the daughter of the highest god aided his journey, and even ushered the bloody slaughter. The windking Zeus the highest of gods is another reinforcement of his connection with heaven. On his journey, Ulysses also received favor from divine figures like Circe and Calypso, even as he received rancor from figures like Poseidon. As the evening was getting dark, Dante concluded the conversation by saying he had to go somewhere and turn his back following the path along side the Arno river. The Liu Sanjie show is an outdoor performance set in real mountains and rivers in Yangshuo. Yangshuo is a county at the end of the magnificent Li River tour (read my previous blog) from Guilin, in northeastern Guangxi, China. The Liu Sanjie show is staged at the 2km stretch along Li River with 12 mountain peaks as the background. So unlike performances with traditional stage, here we get a show with natural background. This picturesque scenery with various mountain peaks, reflections in the clear water, misty rain, and bamboo forests along with the sound of animals in their natural environment are unique to the performance. The Liu Sanjie show is directed by the famous film director Zhang Yi Mou. He is a Chinese film director, producer, writer and actor, and has won numerous awards and recognitions in international film festivals such as Silver Lion and Golden Lion at the Venice Film Festival, Cannes Film Festival, and the Golden Bear . Zhang also directed the opening and closing ceremonies of the 2008 Beijing Summer Olympic Games, which received international acclaim. It took Zhang Yi Mou three and half years to finish preparations for launching the Liu Sanjie show. The performance lasts for 70 minutes and more than 600 actors and actresses are involved. All the actors of the show are local villagers and fishermen, particularly local minority groups as Zhuang and Yao, who have practiced meticulously. At March 20, 2004 the premiere of the Liu Sanjie lightshow was a huge outdoor performance with 1800, now there are about 3000 seats. Three shows daily, all fully booked during peak season. 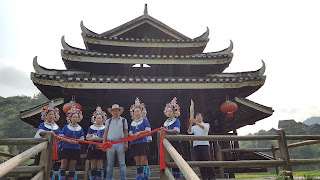 Liu Sanjie is a story that originates from the Zhuang minority people (read my blog about Longji Rice Terraces). The story is about a legendary Zhuang woman singer called Liu Sanjie, which means “third sister”. The legend tells the tale of Liu Sanjie who had a beautiful voice at very early age. Her voice is so beautiful that attracted a gangster named Mo Huairen. The gangster falls in love with Liu Sanjie and wished to make her his concubine. As Liu Sanjie refuses, Mo Huairen attempts to kill her. Liu Sanjie’s boyfriend, Li Xiaoniu, and his friends in the village free her and the couple escape turning themselves in a pair of larks (a small bird with beautiful singing). This Liu Sanjie show is also called Impression Show, as it is focused on impressions rather than the plot, characters. We can watch a bunch of impression, these impressions from the landscape and people's life, with the back ground of mountains on the river stage. The magnificent ligthing system, music and modern visual technology makes the show a magical impression of the Liu Sanjie story. Zhang Yimou uses the natural resources of Yangshuo to give his show a maximum effect. The usage of lights and water emphasizes the beauty of the Li River and the limestone mountains in a way never seen before. At March 20, 2004 the premiere of the Liu Sanjie lightshow was a huge outdoor performance with 1800, now there are about 3000 seats. Three shows daily, all fully booked during peak season. Liu Sanjie is divided into four main parts. The first is called the Red show with long red silk flowing on the river, giving the impression of fisherman throwing out their nets and drawing them in again, as they balance precariously on bamboo rafts. It is an amazing act. Then followed by the Green show which give the impression of the daily life of the people of the Li River. Smoke curling upwards from cooking pots, women washing, in the fields, fishing, all the everyday things in their lives. Then followed by the Blue Impressions, love song of Liu Sanjie the bathing bride in the river, even the moon caught up in this love song. Knowing that Mo Huairen will surely get the magistrate’s support and attempt at Liu Sanjie’s life, the villagers urge her to keep herself from harm’s way for the time being. Liu Sanjie says goodbye to them and embarks on her journey with her lover Li Xiaoniu. Lastly the Silver show, the grand finale, in gold and silver costume change, giving impression of Liu Sanjie and Li Xiaoniu living happily ever after. .
That is the touching Liu Sanjie legend about Liu Sanjie, performed along the Li River with the background of mountains, enhanced by excellent sound and lighting system. It is a great combination of legend, nature, technology, singing, choreography, and the Zhuang culture. What a fantastic show it is ..! What to say about Li River, it is just fantastic. Li River is also called LiJiang in Chinese, as “jiang” is the Chinese word for “river”, so it is wrong to say Lijiang river as used on many articles in English. However people ignore it as it is so famous, everybody knows. Touring by boat for 4 hours along the river surrounded by mountains and mountains, is an endless journey in tranquillity. We can look around during the tour and we can see a 360 degree of scenic landscape. The Li River tour flows through Guilin and Yangshuo with a total length of 116 km. Tourist cruises in different boats, varying from small rafts to larger, air-conditioned boats. It is the major attraction for tourists who come to Guilin. Millions of people each year come to its jade waters, cruising between peaks and islands in search of the landscape beauty. During peak holidays there are so many boats required to carry the tourists, such that the boats are lined-up sailing behind each other like a train on water. The whole length of the Li River is guarded by green hills and the scenic karst mountains. It has been visited by a huge number of artists, writers and poets to admire the river. It is also the most written about river in China. The Li River gives an authentic picture of countryside China. Written and painted by poets and artists, Li River gives a picture book of karst peaks, ancient villages and bamboo. In the Song Dynasty, Guilin had begun to be famous for its natural beauty and said to be the best "Among all the mountains and waters”. Guilin is well-known for its unique mountains and beautiful rivers. There are about 157 rock hills (now under first-class or second-class state protection), 21 major karst caves and several hundred smaller ones. Among the hills and protruding rocks of Guilin, flows the tranquil Li River (Lijiang), which gives a very scenic sight. The Li River flows through Guilin and Yangshuo with a total length of 116 km. Tourist cruises the river in different boats, varying from small bamboo rafts to larger, air-conditioned boats . Millions of people each year come to its jade waters, cruising between peaks and islands to see the landscape beauty. It is the major attraction for tourists who come to Guilin. The whole length of the Li River journey is guarded by green hills and scenic karst mountains. It has been visited by a huge number of artists, writers and poets to admire the river. It is also the most written about river in China. The Li River gives an authentic picture of countryside China. Written and painted by poets and artists, Li River gives a picture book of karst peaks, ancient villages and bamboo. Just round the big turn that the river takes at Xingping is the most iconic stretch of the river known as The Yellow Cloth landscape, which features on the back of the Chinese 20 yuan money. The money shows a fisherman on the river with Yellow Cloth landscape behind it. The place's name comes from a yellow flagstone, long and wide, whose reflection spreads itself on the river like a yellow cloth. The seven hills on the bank of Yellow Cloth landscape have been likened to seven fairy maidens who came from heaven to play at the bank and were so amazed by the scenery that they would not leave. More than the river itself, the landscape is awesome: alluvial plains rippling with 300-million-year-old limestone formations. The geological term for these mountain is karst sometimes with odd shapes that look like something in nature, like the Yellow Cloth landscape. The people used their imagination to name the odd shapes according to the shapes such as : Watching An Apple, Calligraphy Brush, Eight Immortals, Elephant Trunk Hill, Folded Brocade Mountain, etc. Many of these fanciful names are tied to a local legend. This habit of naming of a scenery and tying it to a legend is quite common in China, we encounter it in other places in China as well. Actually, the Chinese people in that way is very imaginative and creative. Among all of the odd shapes, Nine Horse Hill is an important scene not to miss during the Li River tour. Nine Horse Hill is located 4km from Xinping. The cliff face has images of what appeared to be a group of horses. In variation of yellow and white, dark and light, the horses assume a variety of poses: some seem to be running, some just lying there and others playing. These images have been present on the mountain side for centuries. In the Xingping area there is a hill named as Camel Hill. This hill is named Camel Hill as its shape looks like a Camel. In Guilin, Yangshuo and other places in China, there are other hills named as Camel Hill because of its shape. So it is misleading to think that Camel Hill is the one located along the Li River tour, because there are other Camel Hills in China. 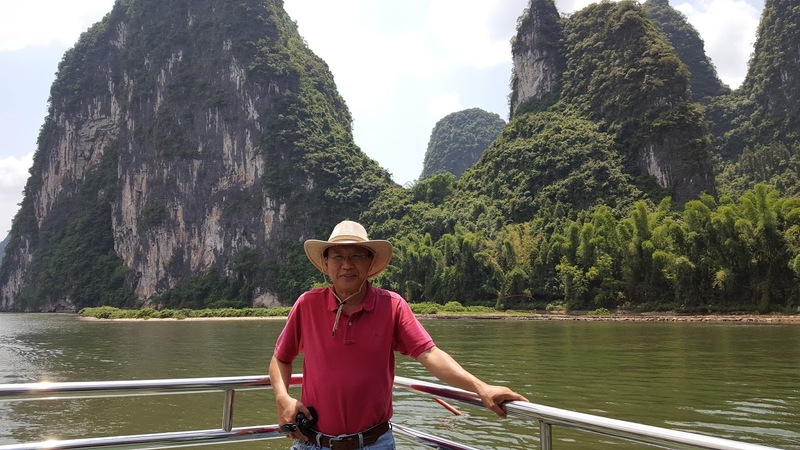 The wonderful 4 hours boat journey then ended in Yangshuo, leaving us with memorable images of the landscape along the Li River, attached by the given fancy names of the landscape. May be that is the purpose of naming them like that. The villages of the Dong people are located among the hills on the Hunan-Guichou-Guangxi borders, China. The Dong people live in villages of 20-30 households located near the rivers. There are also large villages of 700 households. The Dong people grow rice, wheat, maize and sweet potatoes for consumption and cultivate cotton, tobacco, soybeans and rapeseed as cash crops. They also sell timber and other forest products. Their houses, built of fir wood, are usually two or three stories high. Generally, people live on the upper floors, and the ground floor is reserved for domestic animals and firewood. In the old days, the houses of landlords and rich peasants were big and had engraved beams and painted columns. Pathways inside a village are paved with gravel, and there are fishponds in most villages. Dong people are mainly farmers. They are good at growing rice, raising fish in their rice fields. For domestic animals they raise mainly hens and pigs. They live in huge forest, the forests have special spiritual importance for the Dong people but also provides with a source of income. The Dong people grow enormous numbers of timber trees which are logged and sent to markets. Tong-oil and lacquer and oil-tea camellia trees are also grown for their edible oil and varnish. They are also famous for their unique carpentry skills which are displayed in beautiful wooden covered bridges. These bridges are called "Wind and Rain Bridges" because there are pavilions built on the bridge that provide shelter to people from the wind and rain. On a raining day, the pavilions on the bridge provide locals an excellent place to meet, relax, socialize, exchange ideas, and even amuse. Wood, stone arches, stone slabs and bamboo are all used in erecting bridges. Roofed with tiles engraved with flowers, it has on its sides five large pagoda-like, multi-tier pavilions beautifully decorated with carvings. It is a covered walkway with railings and benches for people to sit on and enjoy the scenes around. A specialty of these bridges is that no nails were ever used in their construction. Rather, the Dong carpenters used groove joints in structural members of the bridge to hold them together and transmit the load to the pier. Other specific feature of Dong villages are the drum towers. Meetings and celebrations are held in front of these towers, and the Dong people gather there to dance and make merry on festivals. The multi-storey drum tower, the symbol of a Dong village, is usually built in the flat or high grounds of the village center. A square is built in front of the drum tower, and provides a venue for the entire village to come together for meetings, festival celebrations, and other public activities. Songs and dances are important aspects of Dong community life. All the Dong people can sing their folk songs. The songs called the "Grand Songs" are most popular among the Dong folk songs, especially in the southern part of the Dong villages. The male voice is forceful and vigorous as against the sweet melody of the female voice. Each troupe is composed of members ranging from three to a dozen. The Grand Songs has become famous throughout China for polyphonic folk songs. While some of these folk songs are accompanied by a string instrument called pipa ( a four strings China music instrument) , most are sung without any musical accompaniment. The Dong ethnic minority have no written language, so they use folk songs to narrate their daily life, express their feelings, and keep a record of their history. All of Dong culture is preserved in these magnificent folk songs. In 2009, the UNESCO World Heritage Commission formally recognized the Grand Song of the Dong Ethnic Minority as a World Intangible Cultural Heritage.